Looking to add a little sweetness into your diet for constipation? Having a hard time moving everything through your gastrointestinal pipes and looking for a natural remedy? Well, you may not have to look any further than your grocery store’s produce section! High fiber fruits are extremely easy to come across, which is good news for anyone who isn’t a big fan of barley or lima beans or even high fiber vegetables. 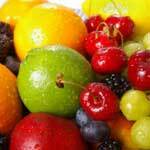 Fruits packing abundant digestive deeds are a great part of many high fiber diets, and incredibly versatile. Additionally, eating fruits raw is much easier (and, usually tastier!) than the uncooked versions of many other foods, which makes high fiber fruits an excellent and unchanged source of dietary fiber. If you’re looking for the big winners, be sure to check out our list of the top 10 fruit sources of high fiber foods list! 1. Remarkable Raspberries: These burgundy berries are not just for making jelly, and boast a fiber content of 8 grams per cup! Get these high fiber fruits when they’re fresh and in season to get maximum nutritional benefit and flavor! 2. Perfect Pears: Don’t peel your pears! Leave on that crispy and nutrient rich skin and enjoy pears raw for 5.5 grams of fiber per medium fruit! 3. Unpeeled yet Appealing Apples: An apple a day keeps the doctor away and it also is a great incorporation into high fiber diets. Apples not only contain 4.4 grams of fiber per medium fruit, they also contain body beneficial vitamins and nutrients meaning that you have to have a pretty good excuse NOT to be eating apples regularly. 4. Brilliant Bananas: An old standby on the list of high fiber fruits, bananas don’t get enough credit for delivering the body solid amounts of nutrients like potassium, along with providing valuable dietary fiber to the tune of 3.1 grams per medium fruit. Bananas are a great on the go snack and lunch-boxable item on the list of high fiber fruits so having one each day is easy and convenient. 5. Outrageous Oranges: Oranges are out first thought when we’re feeling stuffy, but have you ever considered it when you’re feeling a little irregular? Oranges are nearly comparable to bananas in terms of total fiber and are tasty, juicy and hard to resist! 6. Succulent Strawberries: If you’re having a hard time finding high fiber fruits that you enjoy, perhaps it’s because you never knew that strawberries boasted 3 grams of fiber per cup. If you did, you might be munching on strawberry halves while watching late night TV instead of popcorn. 7. Delicious Dried Figs: Figs are rarely an in between food for people, with most either really enjoying them or thoroughly disliking them. Regardless of how you feel about figs, you might want to give the dried versions a try. Tasty, sweet and tart, dried figs can also deliver 1.6 grams of fiber in just 2 medium fruits. 8. Relish-worthy Raisins: As children, many of us may have tossed the red or yellow boxes of raisins lovingly packed into our lunchboxes to the side or traded them for the side dishes of other unaware students, but as adults, those little boxes can add up to big digestive benefit. 60 raisins alone (a mere mouthful for most) has 1 gram of fiber. 9. Appetizing Avocados: Avocados are extremely versatile high fiber fruits that can accentuate other G.I. beneficial foods. Consider using them as a dip or topping in conjunction with other healthful menu selections. 10. Piquant Prunes: Prunes can make many turn their noses up without so much as a taste or a smell but these healthful nuggets are nothing to scoff at, offering up fiber as well as many other beneficial goodies to your needy body.